Don’t you hate those ugly URLs of search results pages with all these “hl& aq aqi aq” extra parameters and when you want to email or send a Google search link to someone you start trimming it and clean up all the extra parameters every time. Well, I do! 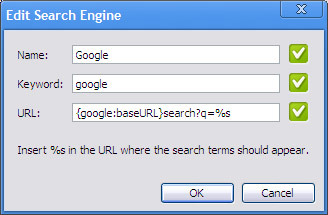 Google Chrome has a cool feature that allows you to have a clean search results URL with no extra parameters. Then make the new search engine the default. Next post: Apple makes people stupid?